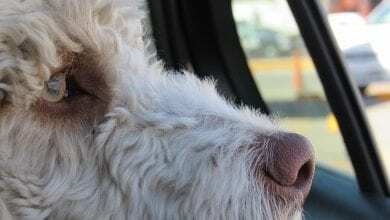 Despite a long campaign titled Dogs die in hot cars, too many people still think that it is OK to leave their dog in a car on a hot day so long as the windows are open slightly and the car is parked in the shade. This is simply not true – on hot days the inside of a car heats up very quickly, with in-car temperatures more than doubling the outside temperatures in under an hour. A car left parked in the shade can soon be in the glare of full sun as the sun moves around. Dogs will quickly become distressed and not just in a physical way. Just imagine how they feel as they are getting hotter and hotter and have no idea of when their owner will return to free them. Unfortunately when you come across a dog locked in a car you have no way of knowing how long it has been there for. Check if the car has a pay and display ticket – this could give you a clue. Check the condition of the dog – look out for the following signs which could indicate that the dog is suffering from heatstroke. Remember dogs die in hot cars so if you see any of these symptoms call the police. They have the authority to break into the car and free the dog. If you feel that the situation is critical and the police are too far away your instinct may be to break into the car yourself and free the dog. Please be aware that without proper justification this is an act of criminal damage for which you can be prosecuted. If you do go down this route tell the police what you are going to do. Take pictures and videos of the dog in distress and make sure there are plenty of independent witnesses to corroborate your story. If the dog is not showing signs of heatstroke they still need to be monitored. If there are a number of you, one can stay with the dog whilst the others try to locate the owner. If you are at a shopping centre or venue ask the management to make an announcement over the PA system. You can still phone the police and ask them to intervene. Move the dog to a cool, shaded area. Pour small amounts of room temperature water onto the dog’s body. Cold water may cause them to go into shock. You can also use wet towels – but soak them regularly and remove them periodically as covering with towels could actually cause them to heat up. Don’t cool them too much that they start to shiver. Allow the dog to drink small regular amounts of room temperature water. Take them to a vet to be checked over.